ver lamb, whatever you have – make it easy for yourself. Here’s the one that I had yesterday for dinner – delish! This is one of my favourite meals! I simply cook up a packet of our Quinoa (whichever one you fancy – they all work beautifully – I used the Sundried Tomato and Kalamata Olive one) as directed (makes 500gm which is enough to fill a one litre container as it’s so fluffy!). I chop up whatever veggies I have in the fridge – usually raw carrot, raw zucchini and raw sweet potato, cucumber, tomato, radish and then add to baby spinach and lettuce leaves. I add however much quinoa I feel like (not too much is required) then mix through. I also added some orange olive oil and some of the Beautiful Maggie Beers Verjuice – yum. I also make sure that there are left overs for the next day too – love the leftover lunch! Feel free to add whatever you enjoy – mushrooms, red capsicum, roasted pumpkin, or avocado, oh yes, don’t forget the avocado! 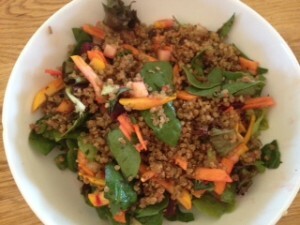 Quinoa Salad rocks!